Most of the mainstream attention surrounding Twitter focuses on the service’s ability to share news and bits of everyday life in real-time with friends and followers. However, a subculture exists where Twitter users also share and track especially funny or interesting tweets. This is done by “favoriting” or “starring” the tweet. Twitter’s Web interface and almost all third-party Twitter clients, allow you to click the Favorite button (a star) and have the tweet saved to your list of favorites. (For example, you can see my favorites here). Starred tweets can be tallied into a leaderboard where your star is your vote. Viewing the most starred tweets is a fun way to find new people and get some good laughs. You can also see who may have starred something you said that they found helpful, funny or clever. I’m constantly amazed at the humor and description that people manage to fit into 140 characters. Naturally, a handful of services have popped up over the years that track these favorites, including Favstar.fm and Tweeteorites. Both of these sites offer iPhone apps as mobile companions, though each offers different functionality. What They’re Tweeting About: Favit delivers popular tweets to your mobile device in a pleasant interface, though there’s not a lot of context. Favit, by Favstar.fm is very nicely designed and features a simple layout. You log in to app with your Twitter ID, which allows you to star tweets and add users from within the app from IMS. Favit’s $30 cost is important to note because, at a time when most lighter weight entertainment apps are priced below a few dollars (even most of the best full-featured Twitter apps sell below $5), the price stands out out. When you launch Favit, you’re presented with a large box that contains a popular tweet. Touch the big, gray star below it if you would like to favorite the tweet. (Touching the star turns it yellow.) The author of the tweet is not immediately visible, but if you pull down on the text box, a small window slides up behind it that shows the author’s name and avatar, along with three buttons below that allow you to add the user to your Favstar.FM list, e-mail a link to the tweet, or retweet it. After viewing the tweet, you can swipe to the right to show the next unread tweet. And that’s it. The Favit interface and design is well done, but the way it pulls in content may not be for everyone. There is no mention of when the tweets you are viewing are from (in fact, I noticed that some are months old). Ideally, it would be nice to know the time period that you are viewing. Are they the most starred tweets in the past 24 hours? The past month? All time? It doesn’t appear to be random, which is frustrating. A Halloween joke is a lot more funny in October than it is in April. Still, if you’re just looking for a quick laugh, even with no context, Favit can be a fun—if expensive—way to spend a few minutes. Follow the Star: With Tweeteorites, you can see which tweets have been starred the most in the last 24 hours (Leaderboard), which tweets your followers are starring (Friends’ Favorites), and whether any of your tweets have been starred (Ego Boost). Tweeteorites by Planetary Scale takes a much different approach to the content it provides, and many people will find it more familiar. 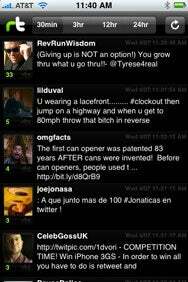 The look and feel of the app is very simple and clean; it reminded of the Birdfeed Twitter client in many ways. When you launch Tweeteorites, you see three main sections (plus a Settings and About window): Leaderboard, Friends’ Favorites, and Ego Boost. The sections are self-explanatory. Leaderboard lists the tweets that have been starred the most in the last 24 hours or so. Each tweet is time-stamped and shows the author’s name, avatar, and the number of stars received. Click on any individual tweet, and a new window slides over, showing the tweet (with date and time), actions for starring or retweeting, and a list of all people that have starred the tweet. The Friends’ Favorites section shows a list of tweets that have been starred by people you follow. Click on any of the tweets to see which of your Twitter friends has starred the tweet. Both the Leaderboard and Friends’ Favorites are fun and easy ways to find other entertaining people that you may be interested in following. The Ego Boost section lists your own tweets that people have starred. (Tweeteorites also has built-in push notifications to alert you when someone has favorited your tweet or you have been added to the Leaderbaord; however, I found the consistency to be spotty at best). Both Favstar.fm and Tweeteorites require that you connect to their respective services so that they can index your tweets and favorites. This also means that people who favorite your tweets must also be registered with either service for their choices to be recorded. Retweeting is a slightly more mainstream phenomenon than favoriting in the Twitter world. When someone retweets a message, they are sending it out to all of their followers, while giving credit to the original poster. Unlike favoriting a tweet, which is passive (no one knows you’re doing it unless they care to look), retweeting shows the message in the Twitter stream of everyone that follows you. Repeat That, Please: Retweet shows the most popular retweets over a selected time period. Colin Tulloch’s Retweet shows the most popular retweets from certain time periods (30 minutes through 24 hours). In my testing, Retweet had a number of problems, offering almost no value as a result. When you launch Retweet, a menu on the top of the screen allows you to select the time period you would like to view. From there, a list of the most retweeted items shows up below. You’re supposed to be able to click on any item to view more details, and retweet it to your followers (if you chose). Every time I tried, I got a different tweet when I clicked through than the one that was listed. The avatars were wrong, and I often got a message saying the tweet could not be loaded. The official Twitter retweet API is fairly new, and perhaps that was at the root of the problem. Regardless, Retweet remains a problematic app. Twitter’s value is different for everyone. Some use it to stay in touch with friends, while others use it to read and share news. One of the aspects of Twitter that I value the most is the sharp, intelligent humor, the plays on words, and the laughs. If you’re looking for an app to follow along with this corner of the Twitter world, both Favit or Tweeteorites offer some chuckles; Retweet only offers frustration.